Experience the beauty of The Legacy Trail as you ride in the comfort of the surrey: a 4-passenger, 4-wheeled canopy covered bicycle. The surrey is ideally suited for mobility challenged individuals, provided they can climb one step onto the surrey. Friends of The Legacy Trail volunteers do the pedaling while you relax and enjoy the sights of a free 45 minute ride along with other cyclists, joggers, and walkers. Sarasota County Parks, Recreation and Natural Resources, in partnership with Friends of The Legacy Trail (FLT), presents the Surrey Program which offers a way for mobility challenged residents and visitors, who would otherwise be unable, to share in The Legacy Trail experience. Four-wheeled, surrey-type bicycle with a canopy cover while volunteers provide the pedal power. Max 4 people capacity per ride. The rides will be free. No smoking or bringing pets. The surrey runs three times a day with departure times on the hour from 10 a.m. to noon, every Tuesday and Wednesday. Please check-in inside the lobby. Call 941-486-2757 and leave your name, phone number, number of people in your party and your preferred date and time. A staff person will return your call to schedule and confirm your reservation. Please allow 2 business days to return your call. You will receive a reservation reminder phone call one week prior to your scheduled ride. Surrey rides may be cancelled due to rain or extreme cold. To check on weather cancellations on the day of your scheduled ride, call 941-486-2753. Tax deductible donations may be made here. Or mailed to: Friends of The Legacy Trail, P.O. Box 792, Osprey, FL 34229. 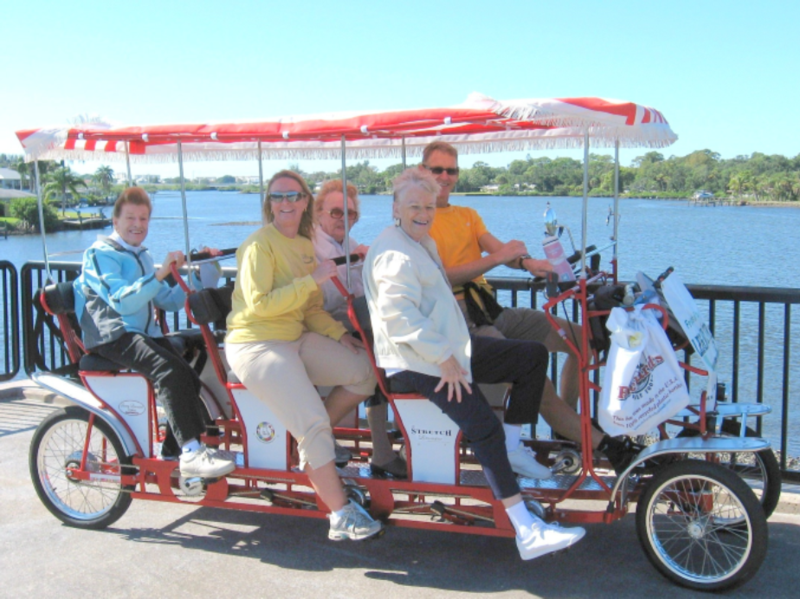 The surrey was donated by Friends of The Legacy Trail to Sarasota County Parks, Recreation and Natural Resources to promote The Legacy Trail and other Sarasota County parks. If the idea of pedaling the surrey is appealing to you, click here to contact us. Also, if you have an interest in this program but do not feel you can manage pedaling, we have a need for greeters and schedulers. For more info, contact us.